Dehydration occurs when our body loses water or fluids, exceeds the amounts that is taken in. With dehydration, more water is moving out from our bodies and cells than what we take in through drinking. In this article, I will tell you signs of dehydration, symptoms of dehydration and home remedies for dehydration. Bananas are the one of the best fruit that you can eat to get rid of dehydration. Our body lost minerals during dehydration, bananas help to restore these important minerals. So eat 2-3 bananas in a day. You can also drink the banana shake. Drink 1 glass of coconut water can also cure dehydration. Coconut water contains high electrolytes which make it a very hydrating drink. Coconut water has low calories and sugar. Drink coconut water several times can help you to rehydrate your body. Coconut water is quickly absorbed by the cells so you can see quick results. 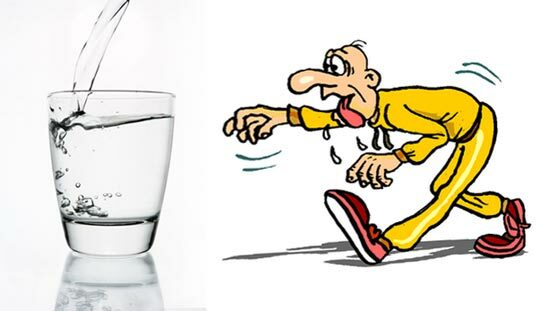 Our body lost some minerals during excessive sweating; this is the main reason of occurring dehydration. Buttermilk fulfills the needs of minerals required by our body. So drink one glass of buttermilk daily to cure dehydration. Alternatively, you can mix ½ teaspoon of dry ginger in a cup of buttermilk. Barley water contains nutrients that help to replenish minerals lost with dehydration. Soak 1 cup of barley in 3-4 cups of water. Now bring it to boil, and then simmer for 45-50 minutes. Allow it to cool to room temperature and strain it. Now add little lemon juice and honey. Now drink this barley water several times in a day. Lemon water is also one of the best home remedy to cure dehydration. Mix ½ tbsp of lemon juice in one glass of water. Now add 1 teaspoon of raw honey and ½ teaspoon of black pepper powder. Now add a pinch of salt. Drink this soothing drink daily to keep your body hydrated.